Love to experience of a place like this whether during a hike or on a path within my thoughts. Colours, lights and smells rolled up in sensations as I pass through, carefully, not to disturb the essense of things. People write about experiences like this. I paint them. 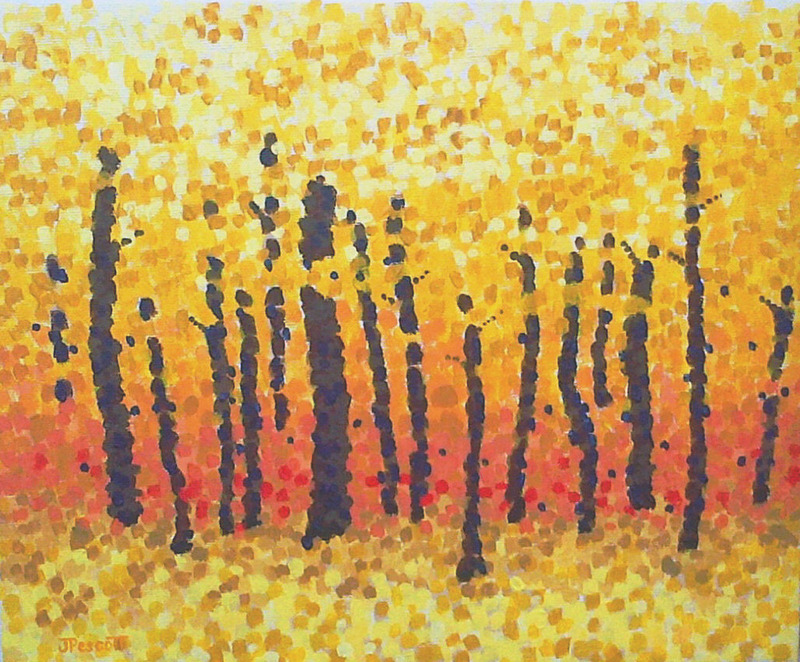 American poet, Robert Frost, wrote “two roads diverge in a yellow wood” and somehow touches me as I paint. The spectre and foreshadowing all dwell within the trees as he continues reflecting. Wondering about trees in your world and what transpires for you. Most Recognized Painting In Italy? Something very cool happened back in December when my paintings were in Florence for the “Symphony of Color” exhibition. First, the VF Agenda section of Vanity Fair magazine, the Italian issue, listed the “Symphony of Colour” exhibition in Florence as one of the top things to do in Italy during September. The organizers of “Symphony of Color” were not aware VF Agenda was listing the exhibition until the mention appeared in the Vanity Fair issue. 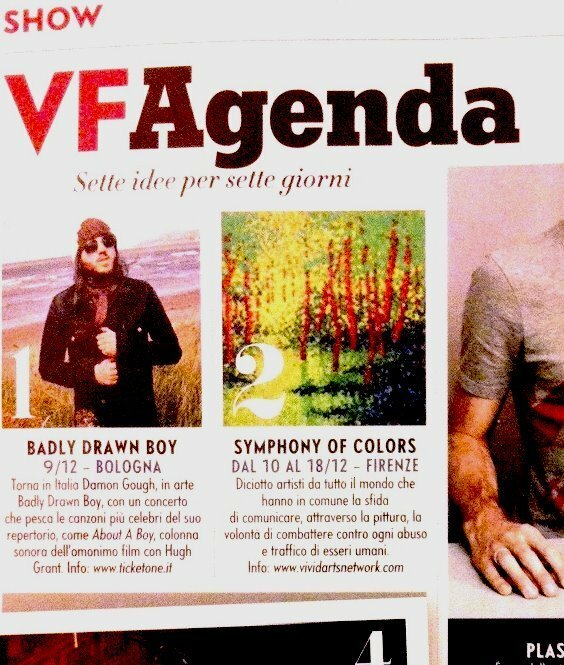 Then, the other very cool something that happened is VF Agenda used an image of my painting “Red Trunks” to illustrate their mention of “Symphony of Color”. 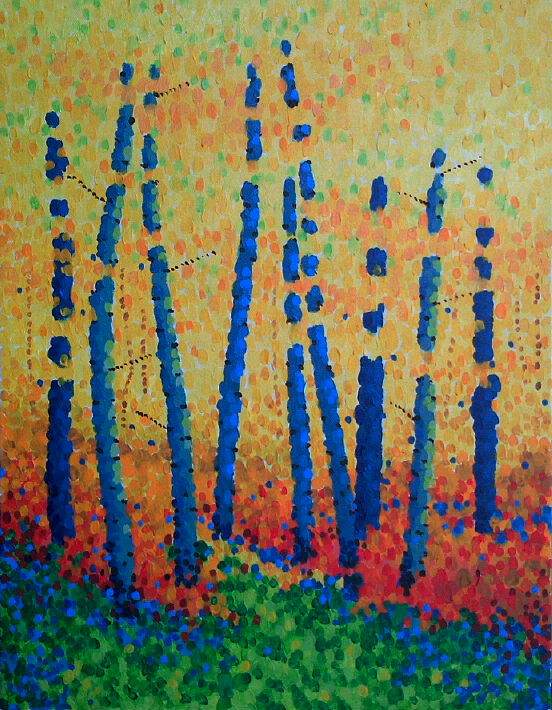 At the time, this Calgary Artist was in Paris, France, attending the Salon 2011 for the Societe Nationale des Beaux-arts at the Carrosel du Louvre when I learned VF Agenda had used “Red Trunks”. The message I received was through a through a Facebook message that shared the image from the magazine. This is the same image you see with this post so the quality could be better but currently it is the only copy I have. 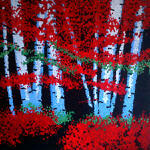 Arguably, “Red Trunks” was one of the most recognized paintings in Italy last December. 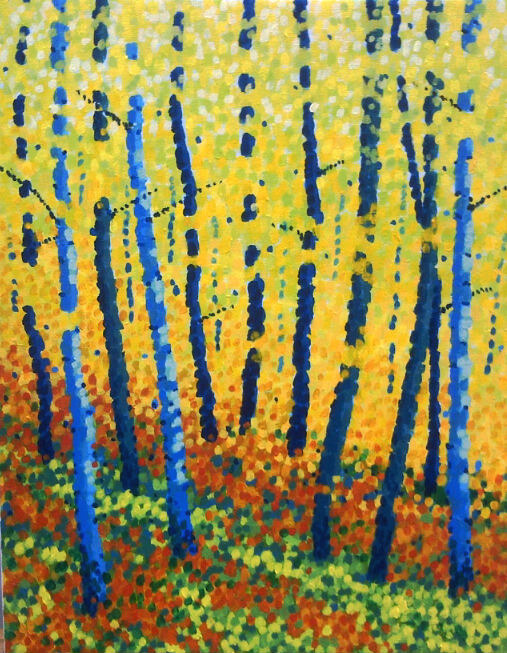 This 12″x 10″ canvas was pretty firm about what needed to happen as the colours of autumn appeared. There’s always a flow of energy in moments like this until I respond to the level desired. “Autumn Light” is the result. Here’s a before the opening, behind the scenes, look at the Quebec 2011 contemporary art exhibition in Montreal from October 13th to 16th. Well, it is behind the scenes for Paintings In Dots as the crate has just been unpacked and the paintings are ready to be place on the wall. It was amarvellous week in Montreal around the exhibition dates. Lots of wonderful new friends. And the paintings must have been sharing “en francais” as they too have lots of new friends. 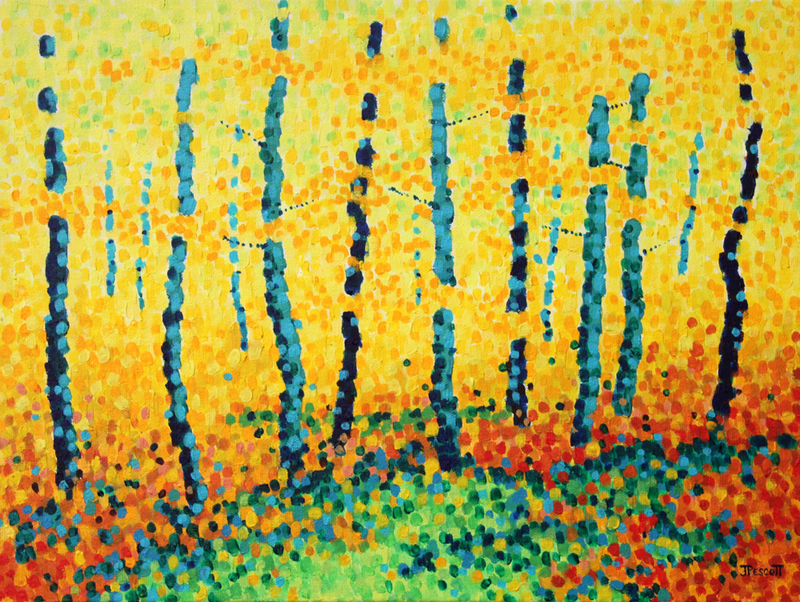 Plus, on the second to last day, a Montreal gallery approached about representing Paintings In Dots. Mais oui!!! Lots to do with two exhibitions in Paris this December as well as an exhibition in Florence. I’ll be sharing more information on this in the weeks ahead!